The survey also reveals that people are really, really over green juice and uni. While the concept and benefits of gratuity are currently at the center of a heated national debate, American diners as a whole are pretty decent tippers. According to a new survey by Zagat and Google of over 9,000 people, Americans tip 18.9% on average. Of all the cities in the U.S., Boston (as represented in the video above by an over-the-top bro) is the most generous city, with residents tipping 20% on average, followed closely by Philadelphia and Chicago. Servers looking for a bigger pay day might want to avoid San Antonio, Texas, where diners tip 17.1% on average. 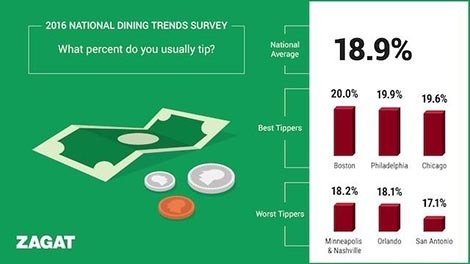 Boston’s high-tipping tendency is even more impressive considering that it is one of the country’s most expensive cities to dine out in. The survey reveals that while the national average for the price of dinner per person at a restaurant is $36, it’s $43 in Boston and $48 in NYC. Restaurants located in the Midwest are definitely more wallet-friendly; the average check is $30 per person in Minneapolis and $29 per person in Detroit. 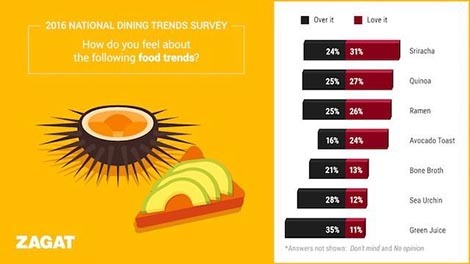 As for what dining trends restaurant goers are into, Sriracha tops the list. The trendy hot sauce—which is now available in packets—is still beloved, as is quinoa and the now ubiquitous avocado toast. People are more split when it comes to ramen, which 25% of people say they is over. People are most definitely done with green juice, uni, and bone broth—even if it comes in K-Cup form.